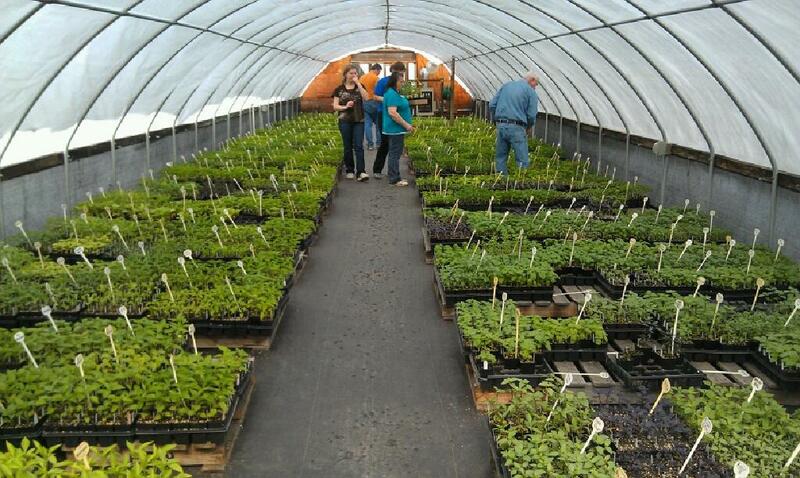 My Return to the Pepper Plant Mecca: Cross Country Nurseries | PEPPERMEISTER! I’ve mentioned them here before, but I just cannot say enough about Cross Country Nurseries in Stockton, NJ. I am fortunate enough to live just about 25 minutes from this absolutely jaw droppingly well stocked and organized chile plant nursery. Before I continue, I should let you know that CCN does the majority of their business through mail order. 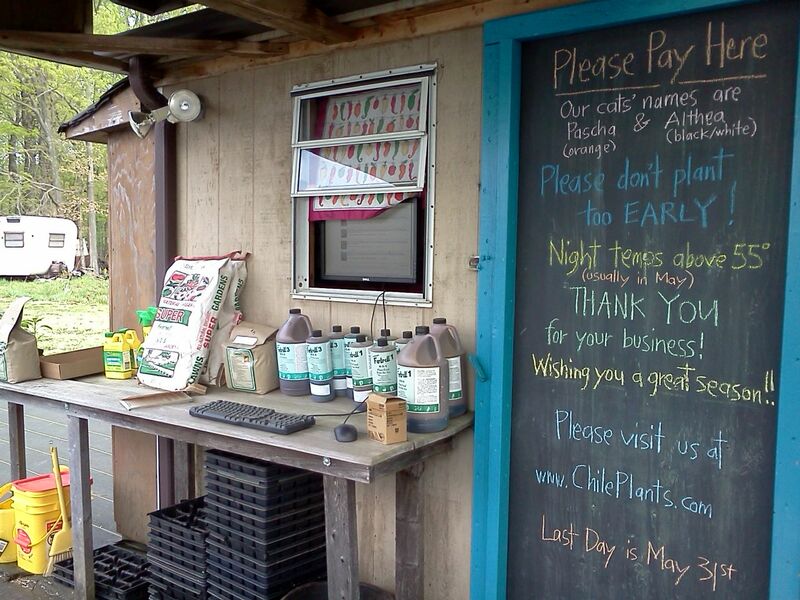 So, if you’re not within driving distance of this place, they will gladly mail out any of their chile plants for you. Yes, those are ALL chile plants. As we did last year, my buddy Tom and I went to CCN on opening day (last weekend). I was well prepared this year with a printed wishlist. Their site, chileplants.com, is a great resource for browsing chiles based on dozens of search criteria that has been meticulously sorted by the “Pepper-Goddess” herself. I picked up about 12-15 plants including a few basil plants. Oh…did I not mention the basil? 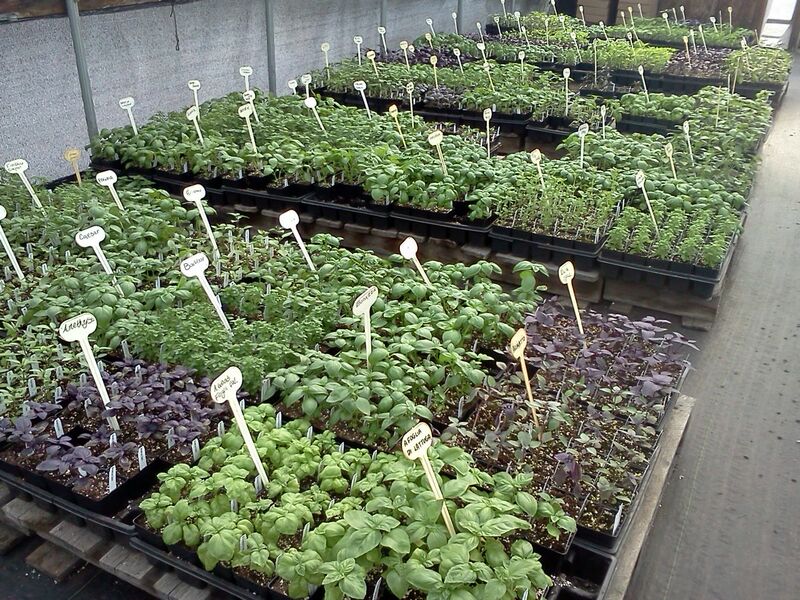 Each plant marker in this entire pic is a different variety of basil. I knew I would be returning soon, so I didn’t want to get too many plants on the first visit. I promptly made plans with my pepper-loving neighbor, Jeff, to return to Cross Country Nurseries this weekend. Jeff wisely decided to get a variety of chile plants that I would not be growing, so that we could increase the amount of chiles we’ll be sampling by summer’s end (get ready for many new Pepper Profiles). We were also able to try the Bhut Jolokia Brownie (Ghost Pepper) that was ominously perched in a fridge among other pepper paraphernalia in the small store/cashier hut. 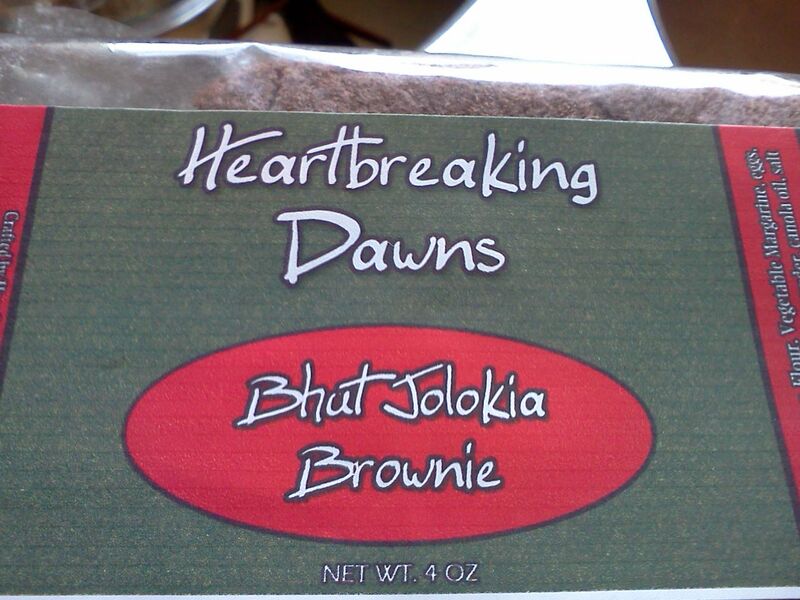 In the car on the way home, we each broke off a generous piece of the brownie, munched it down, then waited. The heat was strong, warming, and quite unique of super-hots. Both of us survived with a few sips of water/coffee and our fear of the almighty ghost pepper was slightly assuaged. We received some first hand advice about transplanting and feeding our plants. The owners, Janie and Fernando, are true chile-heads and they are not happy just selling you plants, but they will give you all of the information they can to ensure healthy plants and bountiful crops. Stay with Peppermeister for chile gardening info, recipes and news! Coming this week: Peppermeister’s 2012 Official Grow List. Click Here for Last Year’s Grow List. Holy crap that’s a lot of Basil!! LOL I had no idea there were *that* many varieties! Nor did I, I thought there were 5 types of basil, tops. This place has over 100 varieties! They also have a TON of healthy tomatoes from all over the world. Basil plants (especially the red and purple) make great gifts. Just plant them in a nice looking pot and you’ll have a thoughtful great smelling and tasting gift that can be enjoyed for months. Pingback: Seed Starting Tips & Peppemeister Roulette Part Deux! | PEPPERMEISTER!